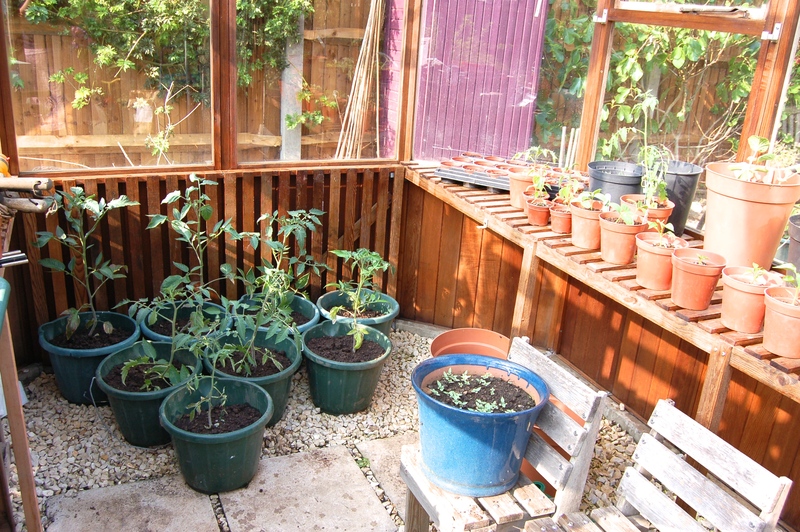 It’s a day I dread, mainly because I HATE lugging bags of soil around, but there was no way I could put off planting up the greenhouse into their (mostly) final pots. On the plus side, my lovely local gardening shop had some cucumber plants, £1.99 for a pot with two seedlings I couldn’t resist and due to my excessive juicing these days, I get through 2 cucumbers a day so it’ll be worth every penny. 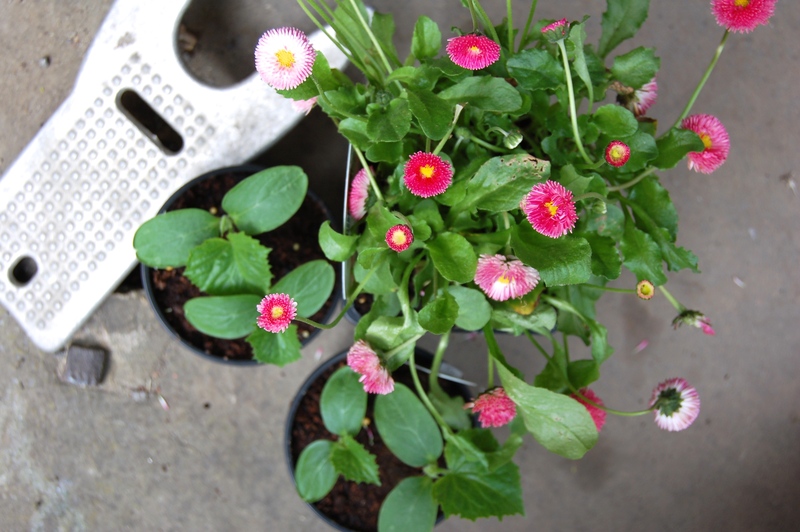 I threw in some pretty pink English Daisies (Bellis Perennis Rose), they aren’t my normal thing but having seen some in a big pot outside my Aunt’s pub on a recent trip to Yorkshire, I just fancied them. Excitingly my Tomtato has arrived! 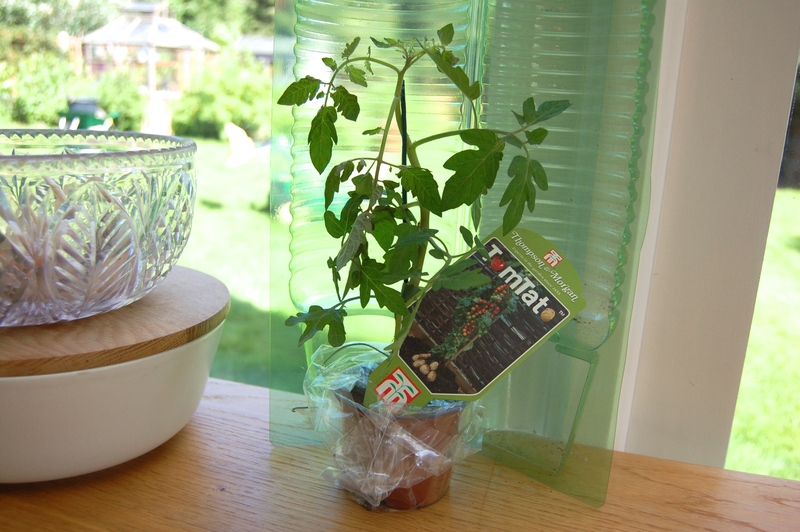 It’s a tomato top grafted onto a potato bottom, more info here. This is an expensive experiment so for now I’ve just re-potted it up in a slightly larger pot and we’ll see how it goes. After the recent rabbitgeddom, I have constructed some very temporally fencing along the line where our new decking area meets the veg patch. I’m sad not to be able to wander between the two, as planned, but at least I know my seedlings are safe. The main garden is getting a thorough munching though and I’m worried about many of my spring flowers returning next year after they have had their heads removed…I hope the few leaves left will allow them to keep going. In the garden, I’ve planted out more peas and I’ve decided to throw all my remaining old flower seed into half a raised bed. I don’t hold out much hope that they will germinate, but I may as well try. From the ones planted in the greenhouse, only my zinnia sprite has taken, that might be more to do with intermittent watering whilst I’ve been away (I left the garden in the hands of my husband for the week). 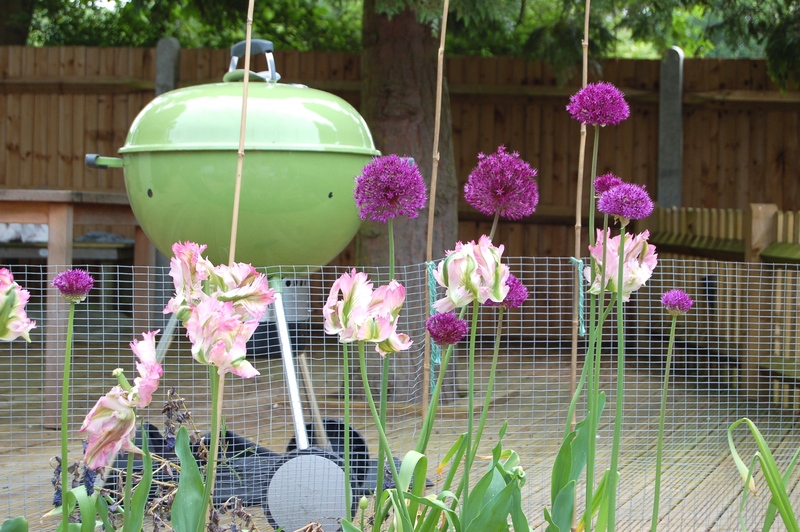 It’s sounds like it’s going to be scorchio tomorrow, so perhaps we’ll be putting the BBQ into use! 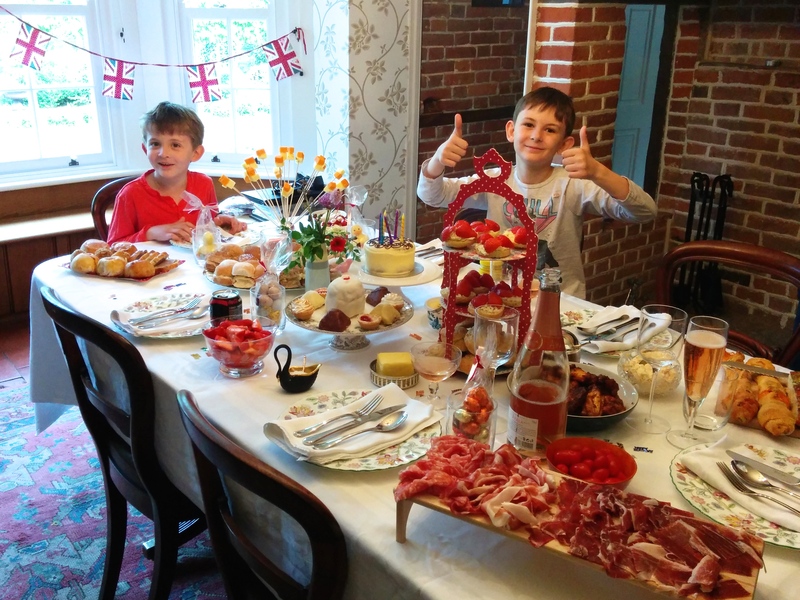 For C’s B-Day my Sister was kind enough to lay on a lovely afternoon tea. We were so spoilt. Check out the comedy cheese and pineapple sticks…on BBQ skewers as she had no cocktail sticks. Oh better still, if you live in the UK, you can order yourself one here!! That’s all…just felt the need to share. The garden is showing all my favourite colours at the moment, I do love a bit of pink, especially at this time of year when the greens are all so zingy. I’m loving all the bruised colour tulips that were put in last year, I had plenty already but you can never have enough! 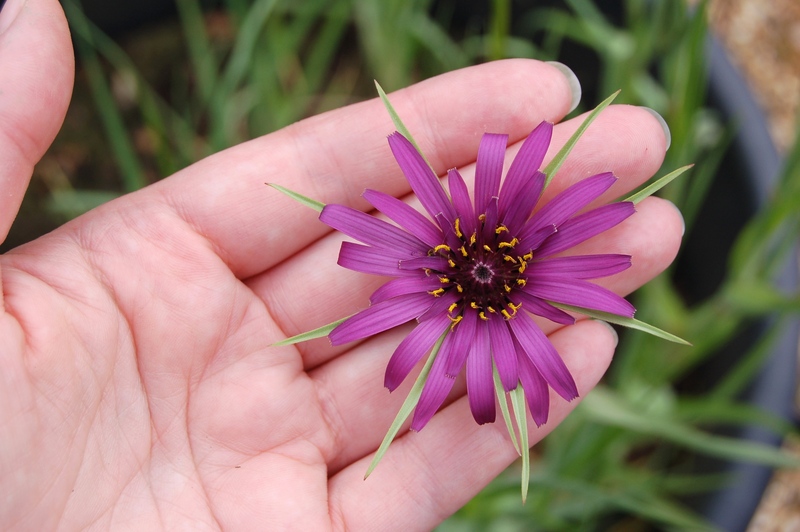 The salsify that I planted for the flowers is also looking rather pretty, it’s in a giant pot at the moment and needs moving into the border at some point, as I am just growing it for the flower and not the root. 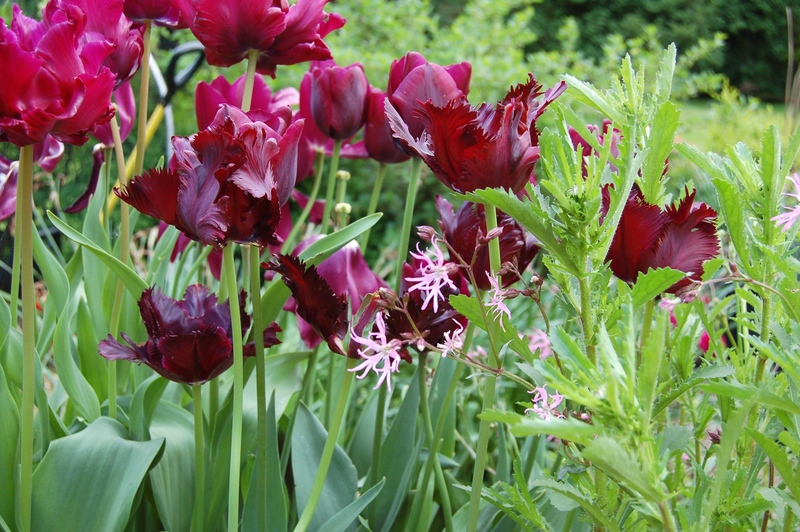 There are lilacs and aquilegias, the alliums are about to open and the iris are well on their way, so the pinks and purples will continue for a while yet. Back the post title. I made some cardamom ice cream a while ago and thought I’d record the recipe here or I’ll forget how I made it. 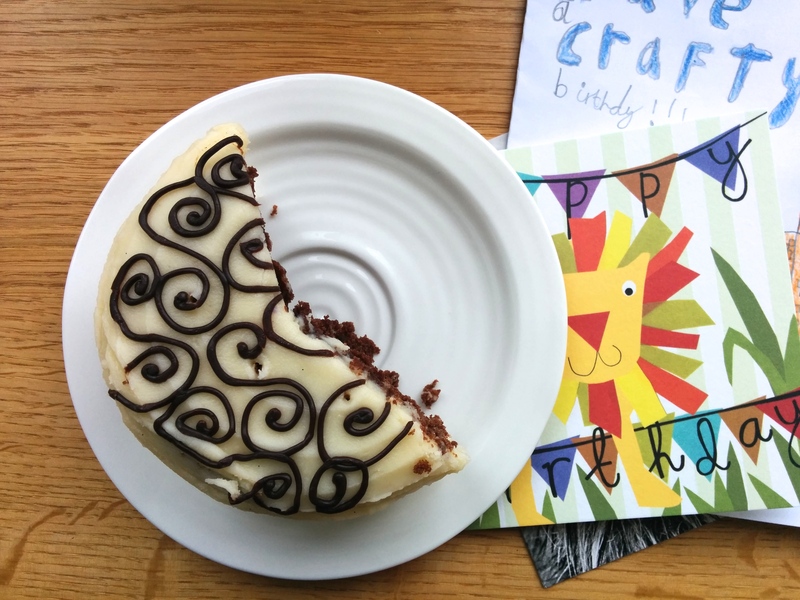 Incidentally, at the time of first tasting it I though it was too sweet, but I’ve changed my mind, oh and I think it could have a little more black cardamom in there as well, as I like the very smoky taste, but I’m not sure the boys would be so pleased if I had added more. Follow the instructions for your ice cream maker and make sure it’s been put in the freezer in advance, if needed. Place the cream (you’ll need another 250ml later), milk, cardamom seeds and vanilla pod into a pan. Warm until quit hot, but NOT boiling them remove and set aside for at least 30mins to infuse the flavours. Sieve to remove the cardamon pods, vanilla bean and any larger seeds. Put the infused cream and milk mixture back into a pan and scald, by heating until just below boiling point, then cool a little. Meanwhile, beat the egg yolks with the sugar, then add the slightly cooled milk mixture, beating all the time. Return to the hob and stir gently over a low heat until the custard has thickened and coats the back of a spoon. Remove and keep stirring as it cools. Once cold, put into the fridge overnight. The next day, whip 250ml double cream until it forms soft peaks, then fold it into the cold custard mixture. Pour into the ice cream machine and when nearly set, place into a large freezer container. Pour over the caramel and lightly turn the mixture with a spoon, so the caramel is swirled into the ice cream (I messed this up a bit, my ice cream wasn’t thick enough so the caramel ended up mostly sunk to the bottom in a puddle). It’s looking good in the garden. I need to take photos but it’s too wet out there at the moment. 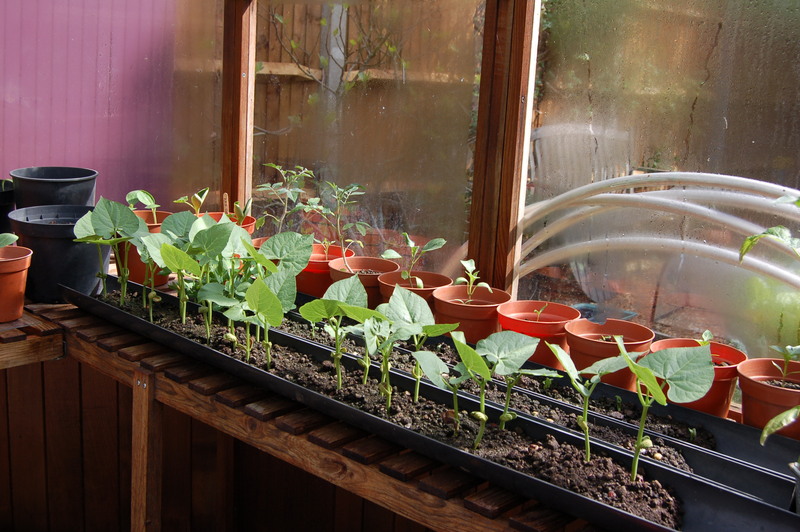 I’ve planted up one raised bed with a row of barlotti beans (started in the greenhouse, as above), a row of broad beans (too close together, but I’m interested to see if I can get away with it), sweetcorn (x10, all that germinated, and planted in two rows now I know from last year that I can pretend to be the wind and hand pollinate them so I’m less worried about the planting layout) and finally some squash. No idea what variety, I forgot to label the plants – doh! I have one bed going with salad crops, beetroot, carrots and alpine strawberries. Sadly the evil little rabbits got in and ate the lot, but I’m hoping some will survive. On which note, the postman just called and his opening line was, “It’s like Watership Down out there!” he has a point, I really need to put some time into replacing the areas of rabbit fencing that have been dug under.